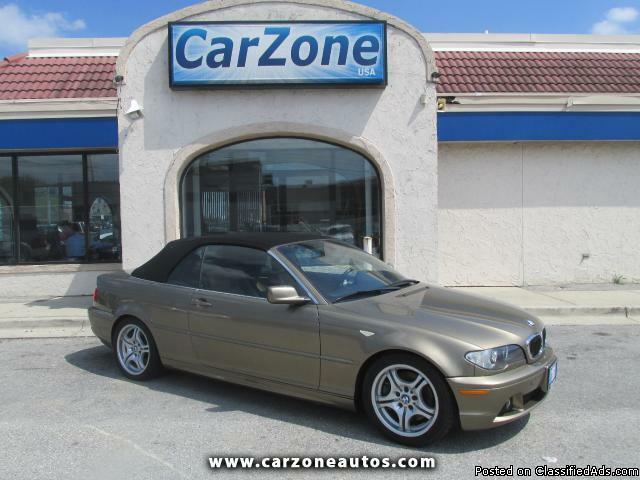 xxxx BMW 330Ci CONVERTIBLE | SMG TRANSMISSION | Sonora Metallic with Natural Brown Leather Interior | The BMW 3-Series is an award-winning car. Car and Driver gave the 3-Series one of its 10 Best Car awards, further claiming that "constant upgrades have kept the 3-series on our 10 Best list for a record 16 consecutive years." Edmund's named it "Most Wanted Sedan under $35,000" and Consumer Guide calls it a "Best Buy." The 3-Series also won the "World Car of the Year" award at the xxxx New York Auto Show. IntelliChoice gives the 3-Series its "Smart Choice" award for their high retained value, and Edmund's says, "Whether your priority is an engaging driving experience, an elegant cabin environment or simply curbside prestige, this car delivers in spades.'' Equipped with a soft-top power convertible roof, SMG transmission, woodgrain trim, Harmon Kardon Sound System, power rear seat easy entry, leather heated seats, Homelink, automatic climate control, and rollover protection, the 330Ci is a spacious, elegant convertible known for its superb handling!